Amma’s my mama. Hug please. Last week Amma was in New York City dishing out free hugs and love to all. 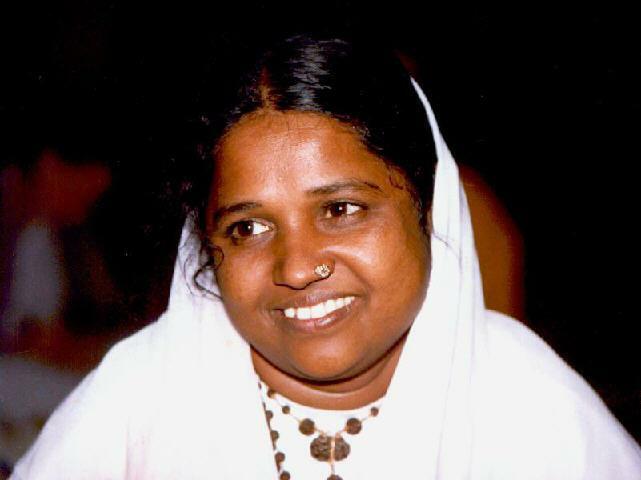 For those of you who do not know of Amma, she is Sri Mata Amritanandamayi Devi otherwise known as Mother (Amma literally means “mother”). Amma is an internationally recognized humanitarian and spirtual leader- the catalyst behind countless humanitarian activities worldwide (from disaster relief to sponsored weddings for the poor). Amma does not subscribe to a particular religion but says her religion is Love. She asks not for you to believe in God, but in themselves.On her tours Amma’s darshan takes the form on an embrace…a hug as we know it. In the past 36 years, Amma has physically hugged more than 26 million people. As many as 200,000 people are known to flock at once to just catch a glimpse of Amma in person! Simply put, she’s kind of a big deal. And here I was, only feet from her feet right here in Manhattan! The program included lecture, chanting and meditation. Oh, and by the way, unbelievable homemade Indian food. I had a heavy plate and I ate over conversation with a Hare Krishna devotee (who splits his time between India and New Jersey!!). The whole event was moving because her devotion to people and the people’s devotion to her felt so strong. It was all around me. Okay, and now the hug. It went like this: Everyone received a token upon arrival and we were called by category to line up. You were ushered down an aisle a la musical chairs, moving one chair ahead each time a person was hugged. There was a team of maybe six people around Amma the whole time. It looked as if one woman was solely in charge of massaging Amma while she hugged. This part did not come as a surprise as I understand Amma hugs for upwards of 12 hours straight with one solitary break! The other members of her pit crew were responsible for taking your bag and/or your glasses, they helped you wipe down your face, and they positioned you on your knees with your arms outspread ready for your turn. As soon as the man ahead of me hugged Amma he was tossed out of the ring and I was hurried into place– thrust into her arms! To get my hug and experience all that is Amma I showed up at the Manhattan Center at 5:30 PM on Wednesday. By the time I received my hug and hit the subway it was 1 AM. It was a wonderful and awe inspiring experience just to be in the presence of her devotees. Everyone’s experience with her is unique and personal. Amma is at once a spirtual leader, a humanitarian and a brand (think Newman’s Own on steroids). She’s a one of a kind do-gooder, and she smells amazing! If you’ve ever hugged her, you’d understand! If you want to learn more about Amma watch this short from ABC’s 20/20 – still not enough? A simple “Amma” search on YouTube is guaranteed to provide countless Amma related video. Learn more straight from the source. www.amma.org.